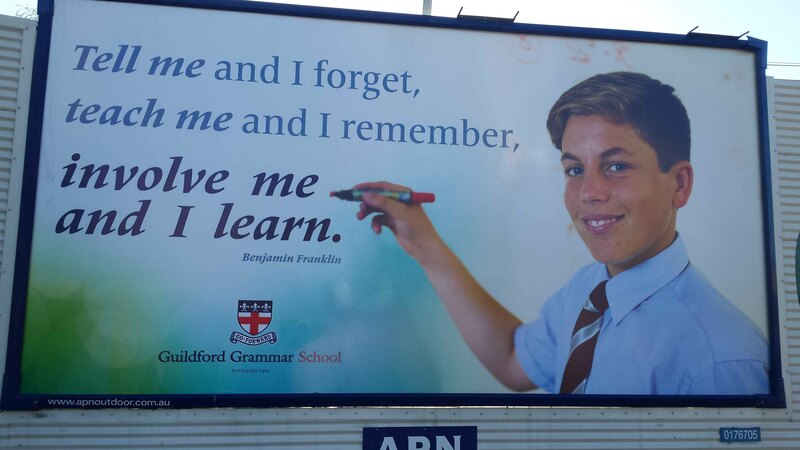 Kids at Guildford Grammar School, next time a teacher tells you off for just cutting and pasting from the internet without checking your sources, tell them that the school has just done exactly that. The above poster, near the Mt Lawley underpass, has an inspirational quote from Benjamin Franklin. Well, almost from Ben. Or, to be more exact, it’s not a quote from Benjamin Franklin at all. He never said it. Or anything like it. The closest thing to this quote is from a 1966 educational book, although some people like to find its origin with the Chinese Confucian philosopher Xunzi (312-230 BC). However, since Xunzi wasn’t translated into English until the 20th century, Mr Franklin could not have been familiar with it. So kids, now you know. Passing off a quick Google as research is fully approved by your teachers. Go for it. UPDATE: The school responds here.